With Christmas coming ever closer, it’s time to think about planning for the holiday season. With all the excitement of selecting a tree, buying gifts and decorating our homes it’s important not to forget about our dogs. Christmas can be a confusing time of year for our dogs. Not only do we erect a perfect peeing post conveniently next to the couch. But we also decorate it with tempting ornaments, blinking lights and edible treats. 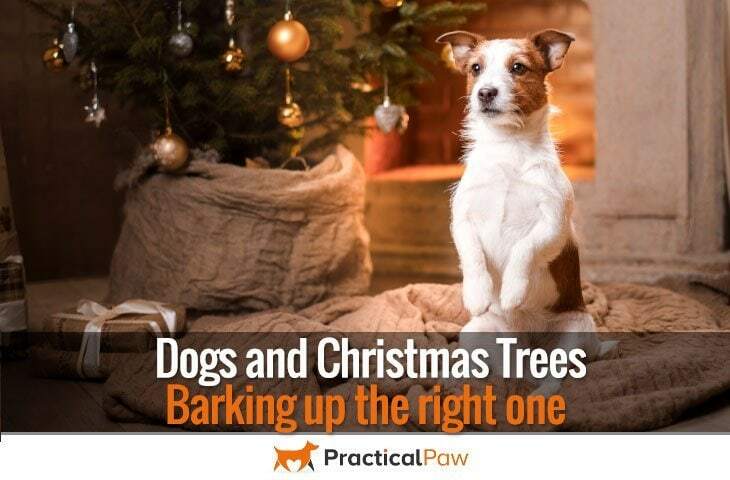 So how can ensure that both our dogs and Christmas trees remain safe this Yuletide? Whether you choose an artificial tree or opt for a real one, it’s wise to keep your dog away from both. Not only are dogs tempted to use Christmas trees as an indoor convenience. But many also enjoy chewing on the branches. Although not considered to be a significant health risk, the pine needles on a real tree will cause a stomach upset if eaten. Also, the oils in fir trees can also irritate a dog’s mouth and cause excessive drooling or vomiting. What’s more, some trees are treated with chemicals to help prolong its life. These can be very dangerous for your dog. as the compounds can leach into the water that the tree stands in. So keep your dog well away from the base of the tree. Besides your dog feeling poorly, the more significant danger of your dog having a chew on a real fir tree is the sharp pine needles can cause internal damage when ingested. Although not quite as attractive as a chew toy to our dogs, artificial Christmas trees still pose a health risk to our dogs. The plastic and wire can cause a lot of damage if eaten. Not only that, the ingested material can create an obstruction in the digestive tract that would need veterinarian treatment. One of the best things about getting a Christmas tree is decorating it. Whether you’re a tinsel enthusiast or a bauble devotee, choosing what gets to go on the tree is all part of the joy of Christmas. However, with a dog in the home extra thought is needed in picking the best ornaments for your tree. If you’re a fan of fake snow, also known as flocking you may want to reconsider this year and go for the natural look. Flocking, angel hair and tinsel, although not toxic can cause an intestinal blockage if eaten. This is also true for decorations made of plastic and foil. Unfortunately, glass decorations are not safe either. Even if your dog is not attracted to the baubles, they can be easily broken if brushed against and the fallen pieces can cause serious injuries. Not only that, but fairy lights pose the additional danger of electrocution if your dog decides to chew through them. Finally, stay away from chocolate decorations as all chocolate is toxic to dogs. So how do you enjoy a Christmas tree if you can’t decorate it? It may sound like a lot of bah humbug, but keeping your dog safe during the holiday season is vital. But that doesn’t mean that you can’t have a decorated tree. It’s just that a few extra precautions need to be taken. Placing your tree in an elevated position is by far the easiest way of preventing a lot of issues. Not only does it help prevent your dog from tugging on the branches, eating something they shouldn’t, and using it as a peeing post. But it also stops them drinking from the water reservoir which could make them sick. Apart from lifting your tree off the floor, the second most important thing is to secure it safely. If your dog decides to jump up at your tree, a corner position offers the best protection for the rest of your room and also your dog. What’s more, if you can attach your tree to a wall bracket it provides the best defence against a leaping dog. Once your tree is off the floor, decorate the top branches with all your favourite ornaments and fairy lights where it’s less likely that your dog will be able to reach. Keep the lower branches for decorations made of dog-safe materials, like paper. Anything that dangles from the branches poses a temptation to your dog. So keep any decorations at the base of the tree small and resting directly on the limbs. They may not be the prettiest of things, but baby gates can be a useful resource at Christmas. If your dog is determined to gain access to the exciting new addition to the room, putting up a physical barrier is often the only way to prevent problems. If you can’t get hold of a baby gate, tin foil is sometimes enough of a deterrent when wrapped around and laid at the bottom of the tree. It’s not just chocolate that can cause problems for your dog this Christmas. Nuts, candy, mince pies and Christmas puddings are all toxic to dogs. Keep everything well out of reach and remember that your dog has a much more powerful sense of smell than you do. Presents under the tree won’t stay wrapped very long if your dog senses something tasty in the packages. Mistletoe is not only full of Luna Lovegood’s nargles, it’s also toxic to dogs. Along with Holly and Poinsettia plants that are a mainstay of Christmas time they are dangerous to dogs if ingested. Keep any decorations or pots containing these plants well away from your dog. Never underestimate the chaos that a wagging tail can cause. Not only is fur flammable, but a knocked over candle can cause a fire that spreads incredibly quickly. Especially when there is so much fuel available like trees and decorations. Place candles on high shelves and use a fire guard if you want to cosy up in front of an open fire. Christmas is the perfect time to indulge, relax and have fun. And for those of us with doggy family members, we want them to be included as much as possible in the celebrations. Although Christmas trees create a potential risk to curious dogs. With a few adjustment, there’s no reason not to enjoy one this year. Keeping our dogs safe throughout the Christmas holidays need not be difficult. Prevention, management and a keen eye will ensure that the whole family can enjoy a very Merry Christmas.